Straight after an amazing weekend spent at Finders Keepers here in Melbourne, I'm back to work, planning a special sale in my Etsy shop to celebrate my first anniversary. 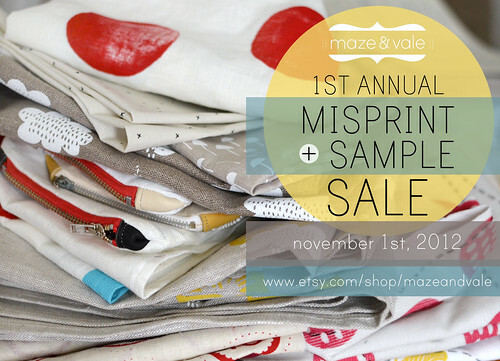 On November 1st it will be one year since I launched Maze & Vale and I've accumulated a year's worth of misprints, samples and special edition pieces that will all be going cheap, cheap, cheap. I can't quite believe it's actually been such a short time that I've been hand printing fabric, it feels so very right to me and I enjoy it so much, the time has just absolutely flown. 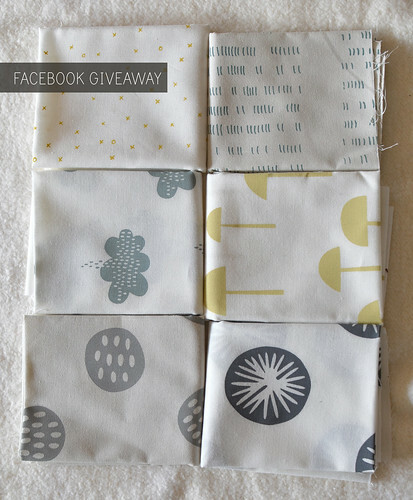 As a thank you to everyone who has followed this journey and a further celebration of my first year, I'm also giving away two sets of six handprinted fabric panels, one here on my blog and one on my Facebook page. Congratulations! I love all your prints, so I suppose all I'd like to see is more of those :) I really like your colour choices and think they all work together very well. Generous giveaway - thank you! I adore the red you use so more more more of the red!!! Thansk for the chance! Oh, I'm a double dipper...entered on fb too because I'm desperate to win some of these to go with what I already have. Happy birthday Maze & Vale! it's the greys and yellows i'm so attracted too, but the simplicity, too... the negative space, the softness. congratulations on this year and on making this dream you've had come true! I really like the colour of the first feather in the first picture, and red, so more of that would be nice. I'm also a fan of inky blue. I love your feathers and rain clouds. I know you're all about the muted tones but l love your use of deep colours like the peacock blue! I'd like to see more colour combinations in your printing. Individual feathers in different colours on the same piece of fabric, for example. Wow, has it really been a year? I love your little prints, the x and o's and the little lines, very pretty in a different way. love your fabric!!!! really love the white on grey/tans. more of that would be nice. Congratulations!!! I love your prints. I love anything that includes grays in the collecitons - maybe lavendars and grays with greens. I love aqua and grays, and especially your nature inspired themes. Keep up the awesome-ness! I love your prints so much. They are just beautiful. I'd love to continue seeing grays. In general I love the colors you choose. Maybe explore some leaf shapes or acorns or even some twigs would all look great and be cohesive with what you have already. Your fabric is just so pretty! Would love to see more prints in red. Thanks for the sweet giveaway! oh, such gorgeous fabric ! Thanks for the chance to win. I'd love some more prints in blue. Congrats on your one year! Love everything. Would like to see more use of Red! Congratulations on the anniversary - I've been quietly following you since you OneGirlDesignWorks days, and have marveled at your transition to fabric printing and how beautiful they are. I really appreciate the way you work with both muted colours and bright ones, and would like to see you continue working with linen, a particular favourite of mine. Thank you for the giveaway! Those are beautiful! I really just like seeing all the photos on your blog - so much inspiration - so just more of the same I guess. I like the grays and other neutrals. Like others, it's difficult to suggest other than what you're doing now, because I love it as it is! I like that some are neutral and some with more vibrant colors. Dusky red and teal are favorite colors of mine. I love your patterns, I would like to see more warm colors like dark greens and blues. thanks for the giveaway. I am a big fan of your cloud and feather prints i don't know what to suggest as i love your palettes, especially the mustard and greys and your prints are always so beautifully done, i will keep my eyes peeled for your misprint and sample sale! Congratulations on 1 year for your etsy shop! I really like your style/signature and don't instantly think of a suggestion for anything new or different, but that is what you are interested in. How about printed fabric with less negative space, same palette. Congratulations...I love your style and creativity...but this would be my christmas list of wishes if I went into your shop on Christmas day! Your colour choices are perfect! Hi Leslie, I am already a big fan of all your prints and colours :) but am especially drawn to the softer colour palettes - the muted greys, mossy greens, dusky blues, anything aqua and the lovely buttery yellows. I also love the smaller scale prints - so would love to see more of those. As to patterns and designs, the ones that reflect nature or natural elements are so wonderful. I know everyone is doing stars at the moment, and I love them too, but what about tiny little moon crescents? Or some little florals maybe? Anything you do will be wonderful. Happy Anniversary! I can't think of any colorways you should add---you already print all of my favorite colors! I'd love to see some scrap packs for quilting in your shop. It's always fun to get an assortment of fabrics for a project! One year! Well done! I love the lotus root prints the best -- I'm not sure how you could possibly improve them, but perhaps a version with smaller scale version of the lotus could be fun! Congrats! Love all your fabrics so far - especially like dove grey, buttery yellow, cotton candy pink, clear baby blue and the teal. Maybe some soft greens? My favourite print is the clouds. Random polka dot type stuff is always good. Is it cheesy that I'd like some little love hearts? Or maybe little envelopes? You've probably got better ideas than I do though!!! Some prints on soft gauze could be fun. Almost congratulations, my gosh where does time go? I am proud of all you're carving out for yourself - in years to come I can say I "knew" you in the very very early days - pre Maze and Vale! I am a sucker for green and it's not a colour I think you've used much of yet. I also think your style lends itself to more textured raw fabrics, although perhaps that affects the printing? Whatever you do, I know it will be wonderful. it has only been a few weeks since i found you. i to would love to see some scrap packs in the shop. i do adore your colour mixings but maybe a few melon tones, almost sparkling green of the honeydew and the washy ornage of a rockmelon. congratulations on your 1 year anniversary! I've bought some of your fabrics for a grey and yellow quilt I'm planning. I love your colour palette as it stands, but perhaps some more rough-hewn fabric, or linen, might be nice? It's all lovely as it is though! Hi, I have just come across your blog for the first time. Congratulations on your first year!! There are so many talented people out there making beautiful things. Your nature inspired prints are lovely in the muted colours. The flash of red is great. I love your current colour schemes, so I hope you keep on printing with the greys/aquas/mustard. Some different fabrics might be interesting, especially lighter weight fabrics (I'd love a gauzy scarf with that feather design! )...although the stiffness of the paint may not be conducive to that. Hi, I would love to see an advent calendar kit for 2012 including your lovely numbers. And if you can release one very quickly, I can have it completed for my baby's first Christmas! I'm really into grays and aquas/teals/turquoises right now so more prints with those colors please. I like how vibrant the reds come out too. Love the nature-inspired prints and the simplicity of the designs. Maybe a few multi-color prints? What do you think about dill and Queen Anne's Lace? Also, you could incorporate some nice greens, maybe. I love your work already, so I don't feel there's a lack, but maybe this will help with ideas. I'm totally new to your shop, but I love the colors, especially the red. And, those circle shapes are really cute. I'd love to see some reds and orange prints. Lovely work. Oh congratulations on your anniversary. I love your colour palette, I was thinking some 'vegetable' type prints would look lovely done in your style. Agreed that I love what you do already! Love simple clean designs. I like too that your designs arn't limited to a specific space - they can be used in homewares, clothing, stationary etc. your fabrics all remind me of natural things, and i'd love to see you design a floral pattern. thanks for the great giveaway! 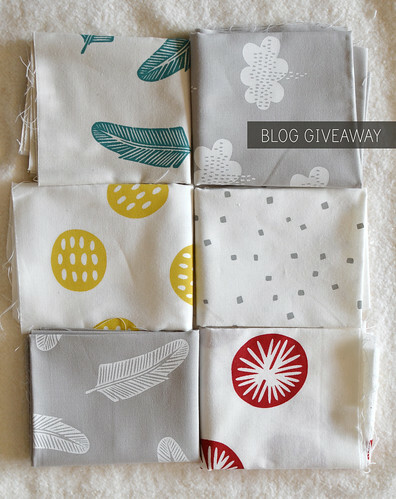 i love the grey base cloth with the white printing and more small scale prints please! I love your fresh designs and would love to see some more handmade items showing off your fabrics. I love the muted colour palette you use, and the organic nature of your cloths and designs so I can't think of anything else I would like to see from you- just more of the same! Thanks for the opportunity to win. Congratulations on your first year! Now that you've figured it all out *wink*, it will just get better and better from here. I adore the grays you use and would like to see them paired with navy. All the best! I would love to know if you can print on the cotton gauze-type fabric that Aidan & Anias swaddle blankets are made on. Thanks so much. Love your fabrics! Great muted colors. I just discovered your blog so I can't give much feedback right now. I can see I'll be spending a lot of time checking it all out. I've spent some more time exploring your work so I've got feedback now (I'm not trying to enter twice I swear)! On your easy shop, you sell some drop cloth artwork that are accidental prints of your work. It'd be kinda neat if you enhanced some of the plainer ones with deliberate color contrasts (maybe splatter the color?) or tried to add an element of a deliberate pattern overlay once the scrap was finished being accidentally dripped and patterned on :). Keep up the awesome work! I love what you are doing! i'd love to see some warmer colours in the inks, and I really love the overprints that you've done, I think they were just drop sheets, but they look fabulous! Wow- just found your prints, and I love them. I adore deep jewel tones, especially plum, so I vote for more of that. Thanks for the chance to win! I love exactly what you are doing so I'd love to see more of the same. Your colors are so vibrantly rich without feeling overdone. Thanks! ooh, finally catching up on last weeks posts! Forgot to say on the FB page 'congratulations' and very happy it's a success for you! Oh, and another entry for more yummy stuff wouldn't go astry either! congratulations! am a long-time follower of your blog, love your eye for colour & pattern. keep doing what you are doing! know that it works! well done! I love the colours you use. I'd love to see some of the prints in white on indigo or red backgrounds. Congrats on your first year! i love your neutrals and would love to see what you would do with more blues...Congrats! Congrats on a year Leslie! Gone fast. congratulations on your first year! i love your creations so much! if i can ask, i'd like to see some patterns on green colors. I am commenting to enter the giveaway. Leslie, I'd love to see the color purple. You pick colors so well, I bet you have a perfect, muted purple, maybe printed on grey. Which would coordinate great with a turquoise green color. Many moons in your lovely colours please. Congratulations on a full and creative year! Congrats on your first year! I have an old oobee (I think his name was Dandelion?) and have enjoyed seeing you transition to new creative pursuits! I love your greys - I find "nice" grey fabric in the right shades can be hard to track down, so I'm rapt to have some of your greys already. Maybe a more opaque yellow as well as the mustard? Look forward to seeing where you go next! id love to see you document more of the process...i love your stamp carving posts. your colour choices are so wonderful, but im always down with the earth tones, shades of brown/moss greens etc.